originally designed c1902. One of his best known and most sought after designs. With what appears to be its original rush seat; probably manufactured by FC Nielson. 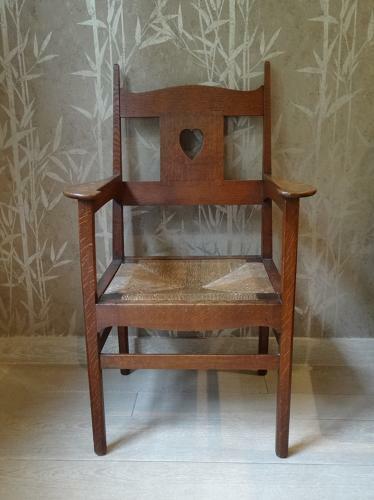 Voysey illustrated this design and indeed other close variants and can be seen in photographs of many commissions. Brighton Art Gallery & Museum have a version with a leather seat from c1906; also the Philadelphia Museum of Art. Other examples are in the collection of Crab Tree Farm in America and also the Detroit Institute of Art.